On a rather windy but sunny day my sister and I set out early for a boat to Tresco, but not so early we did not have time for a cooked breakfast. We are on holiday after all. Tresco, is the second largest island of the Isles of Scilly and just a short boat journey from St Mary's. Most people visiting the Isles of Scilly will island hop at some point during their stay. There are specific boat trips that will call in at a number of islands, whilst giving you a chance to take in the marine wildlife along the way. Today we headed with one task in mind to explore Tresco's Abbey Gardens. Once we arrived I could understand why the plants do so well here, it was very well sheltered from the wind. A real tropical paradise. Plants that were no where near flowering in my garden in Shropshire were in full bloom at Abbey Gardens. 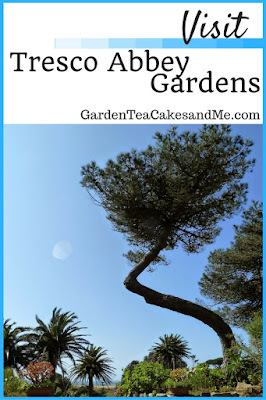 We spent four hours sitting then meandering around the gardens, more sitting and more meandering only broken up with a visit to the tea room for tea and cake. You are sure to spot one of the splendid Golden Pheasants, we did though it was a little camera shy. There was a fascinating display of the figureheads recovered from ship wrecks around the Isles of Scilly. It really was a wonderful way to spend a day, topped of by seeing Red Squirrels a first time experience for me. They were delightful to watch, and the colour of their fur as the sun shined upon it - a warm brown orange glow. Getting to Abbey Gardens from the quay once our boat landed was going to be a problem, I am not able to walk that distance. So huge thanks to the Tourist Information Office at St Mary's and the Tresco Estate, who suggested and helped arrange transport in one of their tiny trucks. Entry to Abbey Gardens cost £12 for an adult ticket and is worth every single penny. You may also enjoy my visit to The Lost Gardens of Heligan, Cornwall. Isles of Scilly look beautiful, you've just added to my travel bucket list! Wow, a tropical paradise indeed. It looks so fabulously stunning, would love to visit.